It is my husband’s birthday and I thought these would be great sandwiches for the three of us to eat after the long bicycle ride this morning. Press the tofu. Whisk together the nutritional yeast, tamari and turmeric. Cut the tofu into 4 thin rectangles and brush both sides with the marinade. Set aside. Slice the sausages into thin rounds. Heat up safflower oil in a skillet and cook the sausage until crispy on both sides. In a non-stick skillet, heat up safflower oil and cook the tofu until done on both sides. Toast the English muffins and spread with Earth Balance. 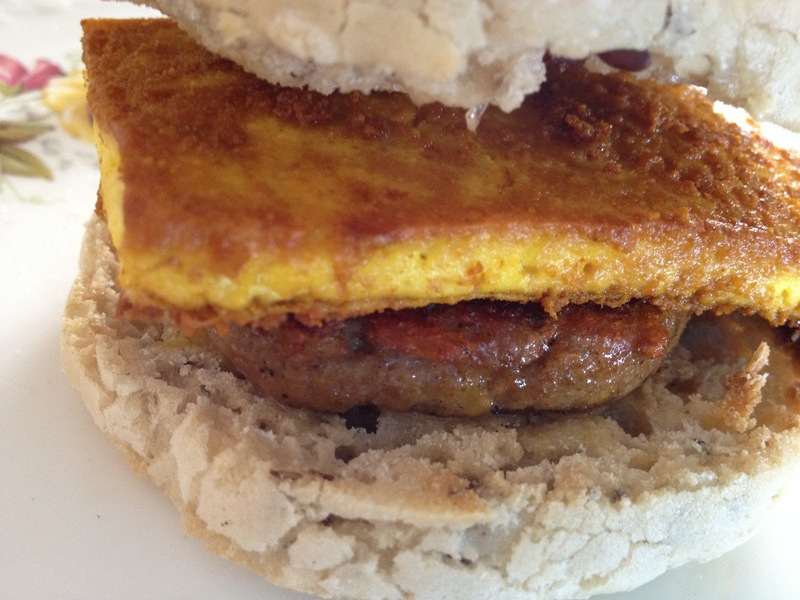 Assemble the sandwich by layering a piece of sausage and tofu on the English muffin. Top with ketchup and enjoy!